Custom Crystals Jewelry Handmade for Party or any occasion with Swarovski Fuchsia Crystals Beads with Heart Crystals Pendant See Through Crystals accented in Sling Rhodium Wire are the perfect for your outfit wear & appropriate for the party or to gift to your love one on the very special occasion. Custom Crystals Jewelry Handmade for Party or any occasion with Swarovski Fuchsia Crystals Beads with Heart Crystals Pendant See Through Crystals accented in Sling Rhodium Wire are the perfect for your outfit wear & appropriate for the party or to gift to your love one on the very special occasion. 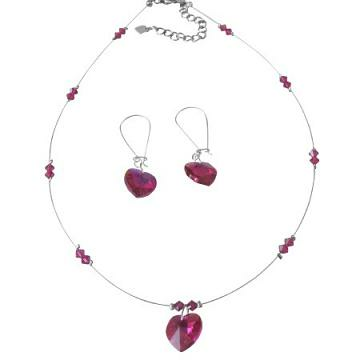 Sparkling Fuchsia Crystals Heart Pendant & Earrings are very beautiful & gorgeous. Handmade Exquisite Necklace All A Grade & Swarovski Crystals Material are used to make this beautiful Necklace Set. Buy Truly Love Artisan Romantic Fuchsia Crystals Heart Pendant Jewelry , sold & shipped by Fashion Jewelry For Everyone where you can shop online for Leading Online Retailer for Indian Fashion Jewelry. This Necklace Sets collection has been tagged as Love Jewelry,Romantic Pendant,Romantic Jewelry,Fuchsia Crystals,Fuchsia Jewelry,Crystals Heart,Crystals Heart Pendant,Crystals Jewelry,Heart Pendant,Heart Jewelry,.